In an effort to strengthen conceptual foundations of eudaimonic well-being, key messages from Aristotle’s Nichomacean Ethics are revisited. Also examined are ideas about positive human functioning from existential and utilitarian philosophy as well as clinical, developmental, and humanistic psychology. How these perspectives were integrated to create a multidimensional model of psychological well-being [Ryff, C.D. : 1989a, Journal of Personality and Social Psychology 57(6), pp. 1069–1081] is described, and empirical evidence supporting the factorial validity of the model is briefly noted. 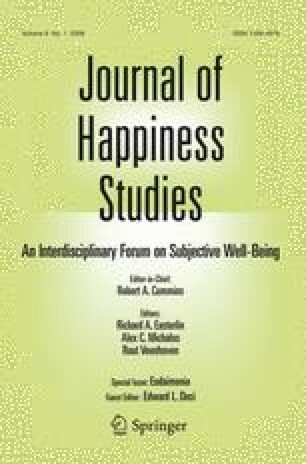 Life course and socioeconomic correlates of well-being are examined to underscore the point that opportunities for eudaimonic well-being are not equally distributed. Biological correlates (cardiovascular, neuroendocrine, immune) of psychological well-being are also briefly noted as they suggest possible health benefits associated with living a life rich in purpose and meaning, continued growth, and quality ties to others. We conclude with future challenges in carrying the eudaimonic vision forward. This research was supported by the National Institute of Mental Health (P50-MH61083), and the National Institute on Aging (P01-AG020166). We are grateful to Emily Greenfield and Alan Waterman for their insightful comments and suggestions on an earlier version of this manuscript.